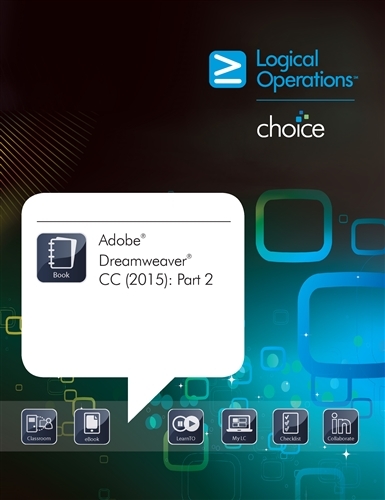 Logical Operations Adobe Dreamweaver CC (2015): Part 2 Student Electronic Courseware includes an electronic e-Book version of the instructor-led training (ILT) courseware, which is preferred by instructors and students alike because of its superior instructional design; HTML versions of instructor-led training (ILT) courseware for any mobile device that supports a web browser; interactive resources designed to reinforce course material; and detailed evaluations designed to identify competency gaps and validate comprehension. Logical Operations Electronic Training Bundle is preferred by instructors and students alike because of its superior instructional design, complete mapping to exam objectives, and the availability of supplemental content in multiple modalities created using single-source development. Logical Operations Electronic Training Bundle, available exclusively through Logical Operations, provides access to an electronic "e-Book" version of the instructor-led training (ILT) courseware; interactive resources designed to reinforce course material; HTML versions of the ILT courseware for any mobile device that supports a web browser; and detailed assessments designed to identify competency gaps and validate comprehension. This course is designed for those who have some experience using Dreamweaver to design or modify websites and want to learn more. Students may be designing sites for the Internet or sites for their company’s intranet. Students may be creating new sites or redesigning or updating existing sites. Students may be creating HTML email or newsletters. Web design may be only one part of the students’ job duties. Or perhaps web design is the student’s primary job function. Students may be artists or developers who wish to use a WYSIWIG tool for speed and ease of use.